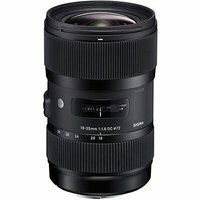 The Sigma 18-35mm f1.8 DC HSM Lens is the first wide-angle zoom lens (as of 22nd April 2013) to achieve a maximum aperture of f1.8 throughout the entire zoom range. The Sigma 18-35mm is a standard zoom lens that offers a focal range equivalent to 27-52.5mm in the 35m format. The 9 blade rounded diaphragm creates an attractive round bokeh at large-aperture settings, while the HSM (Hyper Sonic Motor) ensures a silent, high-speed AF. This lens incorporates a wide glass molded aspherical lens with Special Low Dispersion (SLD) glass to compensate for aberrations and curvature at the widest angle. Its new Global Vision design works with its compatibility with the Sigma USB dock for further customisation. Sigma's DC lenses are designed for cropped sensors and the image circle on this lens is designed to match the smaller size of the image sensor on small-frame sensor cameras (DX-format on Nikon and EF-S on Canon). The lens is ideal for landscapes, portraits, still life, snap shots, casual, and close-ups.